OFFICIAL THREAD FOR THE INVASION. This is the current state. Eldar can make the first move. The Eldar have decided to go for a simple strategy. They will be headed for small settlements and try to ransack and take slaves. Diar will be the first target. Alledonian troops stationed around the abandoned Beach Town retreat to Diar, where they set up reinforcements. Neider Forest troops move towards Diar, and Bellia, hoping to fend off the Eldar. Unfortunately, they are not fast enough to evacuate all the citizens. Hopefully they will protect the cities, and hold the Eldar on the Beach. Also ships stationed at Port Carmichael are preparing for an offensive on the Eldar Fleet. It is a suicide mission. The Eldar force of 10,000 move up the beachhead into the forest line. Moving towards Diar, they have abondoned their ships on the beachhead, leaving it with workers and slaves. OOC: Oooh this could be good. I'll take a few hours (real time) or more to formulate my defense. Port Carmichael ships have moved towards the Eldar fleet, finding it abandoned, they move on board of the ships. Some workers begin to attack the Alledonian soldiers, they are quickly put down. Slaves are freed and put in control of the ships. The ships are turning around now, moving back to Carmichael. The Eldar are stuck at Alledon. The Eldar attack force has not heard of the Way Ships being stolen. They continue pressing towards Diar, killing all in their way. Royal Foreign Minister wrote: Port Carmichael ships have moved towards the Eldar fleet, finding it abandoned, they move on board of the ships. Some workers begin to attack the Alledonian soldiers, they are quickly put down. Slaves are freed and put in control of the ships. The ships are turning around now, moving back to Carmichael. The Eldar are stuck at Alledon. Out of the mist that rises comes a loud Horn, the Horn of Braddia reaches the Alledonian shores, the 40 Braddian refitted First Rate Ship of the Lines with 100 cannons at each side arrive at the Battle field surrounding the beach and bombarding Eldar Camps. and blocking Eldar reinforecements. Admiral Brett waves the friendly flag to Aledon, saying that they will honor the alliance and will fight for the free world. Braddian Forces begin to fire on the eldar who are left on the beach. Meanwhile they watch if reinforcements of the Eldar come and try to stop them. A message bird has been send to the Alledonian Capital to make contact over what the Braddians can do to help. If your forces remain strong on Gray Beach, do whatever you can to eliminate the eldar. Do not let any escape. Kill as many as you can, take only their leaders prisoner, we might be able to learn a thing or two from them. Remember: Give no quarter to any but the leaders. Capture their leaders. Take them to Castletown. Farseer Pr'tui looked up from his meditation. "So the primates have captured our armada," he thought to himself. He stood up and started communicating orders to his troops. The 10,000 Eldar would turn this area below Diar into a fort meant for a race such as the Eldar. 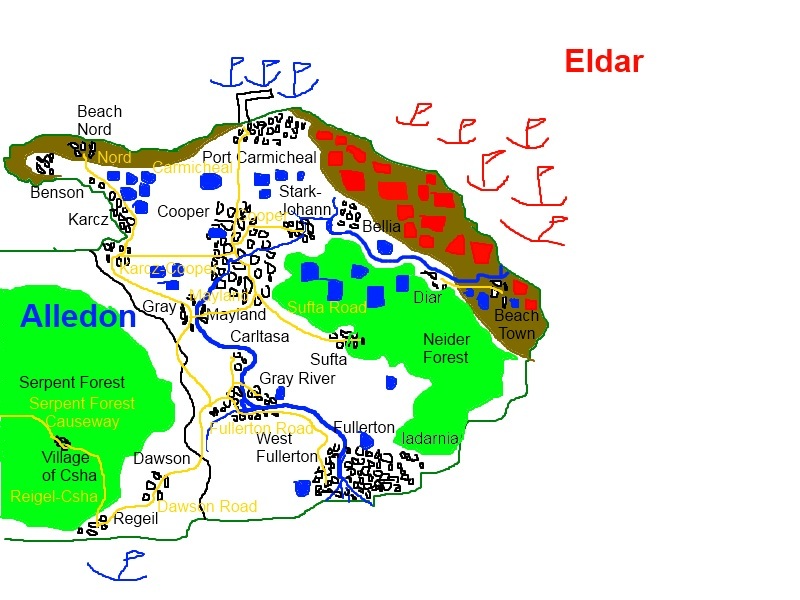 The Eldar fortress has been setup around the area of Diar and the forest surrounding it. Warlocks have already established a Way gate and 50,000 Eldar troops have reinforced it. They have decided to go for a turtle tactic and expand their new fortress until it reaches an enemy settlement. Uh, how far? Because Alledonian forces (you don't know this) are up in the trees of the forest. They are trained for sniping. If anyone comes deep enough into the forest, they will not return. OC: See where the word Diar is? Draw a circle around it for about a 1.5cm radius. That will be okay but snipers abound just around the border. Anyone who goes in will be annihilated. Within the past weeks, the Eldar territory has grown, all settlements in the area have been taken, portals have erected and troops numbers are now sitting at about 250,000. I was waiting for your update.... Anyway, I have been thinking about this for a while, but I don't have time to write it out right now. The ships taken from the Eldar on Gray are headed towards the Eldar Island with Alledonians and Braddians aboard. They plan to sneak in as close as possible and then attack. I'm sorry to burst your bubble, but remember, only Eldar Warlocks can control Way Ships. (OOC: The ships are magic, created from the Way itself, only Warlocks can minuplate the Way, and sorry, but Warlocks have extremely powerful magical abilities, capable of ripping the skin from the fless of a person head. The Eldar are too freaking powerful. I think the Eldar thing has gone on a little too long.